Create a special place for your child to store all their valentines they might get in a fun and creative way. I have created a nice size list of fun Valentines Day Boxes your kids will be gushing over. These Valentines Day Box Ideas are easy and will be an instant upgrade for the holiday fun. Exchanging homemade cards and valentines has always been something my family enjoys. Whether your child is in school or not, you might find this craft to be a perfect fit for Valentine’s Day. Grab the glitter, glue, and other supplies and get to crafting. Swoon instantly at the site of this colorful and fun Unicorn inspired box. With a handful of supplies needed, your child can create a one of a kind unicorn in no time. Here you have a robot that will take you to a whole new universe on the coolness factor! With a little time, you can have one outstanding and unique box to stuff in your valentines. Oh boy, is this taco inspired valentines day card box adorable or what? If your kiddo loves tacos than this is a must make card box. How adorable is this cactus? I mean come on, this takes the cake on being creative. If you have a Cricut or Silhouette machine this is a wonderful valentine box idea. Pandas are so fun and this love box is such an outstanding idea. Not much work goes into but the payoff is fabulous. I love the idea of using your Cricut to get a truly out of the box idea for your valentines day box. I think any little kid would love to have one of these to stuff their valentines into. I love the bright colors of this heart-shaped box. It screams Valentine’s Day and doesn’t take too much work to make. The perfect way to showcase your valentines. I never knew monsters could be so cute?! Boys and girls both will be begging to make this fun and silly monster that will eat up all your valentines for safe keeping. A classic game that might take you back to your childhood. Truly one of the most unique Valentine boxes yet! If you have a somewhat older kid they might really enjoy this one. Take off into space with this epic rocket inspired valentine box. Boys will love this creative little box to stuff all their loving and fun valentines in. What a fun idea to give the valentine box a classic ‘mailbox’ look. With a little cardboard, paint and some supplies, you too can have your own mailbox. Maybe you don’t want the traditional valentine box, check out this fun cupid box. I think I know a handful of kids who would love this idea vs a more traditional box. Here you have a really creative way to take a plastic container that you transform into a bumble bee. Grab that construction paper and spend some time making this bee. Check out this pom pom filled heart that is going to scream drop those valentines in me! So simple to make and such a festive card box that will put a smile on anyone’s face. If you have a round box, you can transform it into a pink ruffle cake box. Colorful, pretty and such a dainty and colorful pink cake box. Here is another great box that uses a round box to get transformed into a furry kitty in minutes. I love how simple of a design this is. Maybe a cat isn’t your thing, then check out this super adorable and enjoyable shaggy dog valentine box. I love how real this doggy box looks like. I think this is such a wonderful idea, I love the bullseye take, and in the heart of the shape. Fits right into Valentine’s Day instantly! Plus easy enough kids can have fun helping. If you are a fan of Minions or Despicable Me, you have to try this incredible Valentine’s Day box! I love this purple guy, he would be epic for stuffing in your holiday cards. Look out for this incredible alligator. With a box and some egg cartons, you can totally transform it into an adorable and sassy alligator that will gobble up all those valentines. 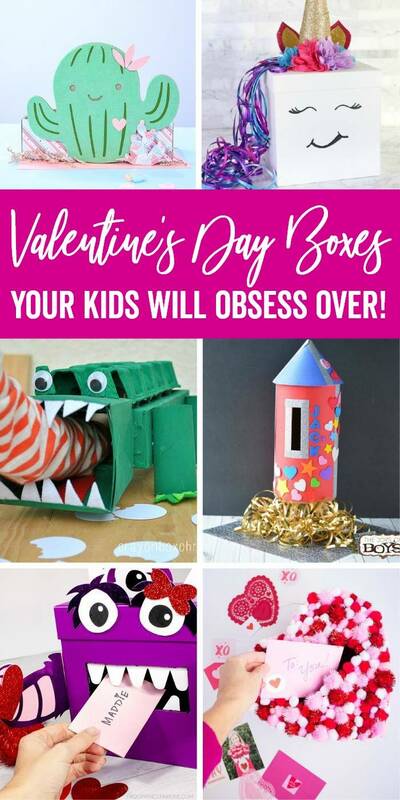 Do you make a homemade Valentine’s Day box for your kids?